Rare frogs are being given help in the romance department with their own so-called "love shack" at the city's zoo. 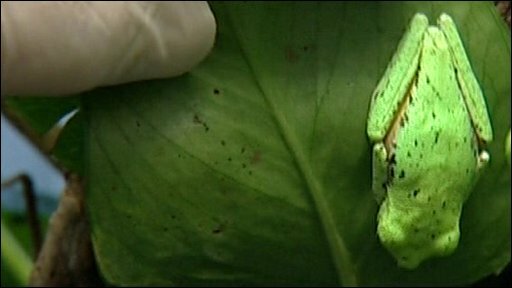 The endangered lemur leaf and golden mantella frogs are moving into a special breeding sanctuary at Bristol Zoo next week. It is hoped the "AmphiPod" will save them from extinction by providing the perfect breeding conditions. Both species are listed as "critically endangered" on the IUCN Red List of threatened species. The lemur leaf frog is found in only a few places in Costa Rica and Panama, while the golden mantella hails from Madagascar. Tim Skelton, Bristol Zoo's curator of reptiles, said the facility would allow staff to adjust the temperature, humidity and day length. He added that the AmphiPod would be "a vital tool in helping to save high-risk frog species from the danger of extinction - which is currently a very real and near threat". The crisis is mainly due to the destruction of their natural habitats by man. However, due to pollution and climate change, amphibians across the world are also threatened by the fungal disease amphibian Chytrid. Mr Skelton said the AmphiPod would allow keepers to keep frogs away from any threat of disease, and help staff learn techniques for the specialist care of amphibians. "In future we will be able to provide a safe haven to other amphibian species in immediate danger of extinction," he added.